The visceral portrait of everyday horrors juxtaposed against the speaker's personal horrors, the kind of horrors that prefer to remain hidden behind closed doors, hang like a tornado-ready to consume everything in their path at any moment. Readers are immediately swept up in the storm, our hearts and minds twisted with empathy and outrage at the scenes before us. The first poem, "Growing Up on a Cattle Farm," sets the stage for the entire collection. Our speaker as a young girl and her father are caught up in the tornado and its devastation playing openly right in front of them, while the mother stands, indifferently and arguably intentionally at the stove, making meatloaf-"Her hands are red with beef," as if nothing is out of the ordinary. This calm, almost dead detachment, is the connecting tone of these poems, which makes the debris of falling moments hit with that much more impact. In the poem, "Sissy," we see a portrait of futility: a little girl holding a dead goat; a sister pretending to get help--"to call the vet"; the little girl refusing to give up as she "Breathes into him/as hard as she can." This poem eloquently defines the perpetual cycle of abuse that, more finitely, rears its head in later poems. The cycle of devastation, of pretending, of wishing maybe it isn't true, of hoping that if we believe and if we pretend and if we continue it will suddenly be something else, come back to life, when all the time we know such devastation is final, is death. "Father Was a Hard Man" gives us the first peek behind the hidden door of the speaker's family life. Subtle flashes of a growing undercurrent of constant terror are planted like seeds before our eyes. "He always came back at dark . . . I always packed/my Barbie doll case.//Dreamed of crawling out the window." This image of a child, clutching her innocence in a case, dangling on the edge of indecision while praying for escape effectively haunts the rest of the pages. This tiny ghost screams for anyone who can hear. Much like passing a deadly accident on the freeway, we cannot help ourselves; our eyes immediately begin searching for a glimpse of the injuries, the possibility of a body. In "Chicken" we start to see a crack in detachment's veneer. In this heart-breaking moment of a child being blamed for something outside of her control-a chicken's broken legs-we hear the vicious mantra of a helpless/useless parent: "Mother/is pissed. Curses. Blames me. Rotten." The speaker is pulled deeper into despair-an abusive father, a helpless sister, a spiteful mother. It is no wonder that she relates to the tragedies around her. The dead goat, the chicken with broken legs, the exploding chickens, the broken eggs. Poem after poem, through this symbiotic bond between the speaker and farm accidents, the land itself bleeds for the speaker. The title poem, "House on Fire," is a perfect example of this connection between the speaker and the land. 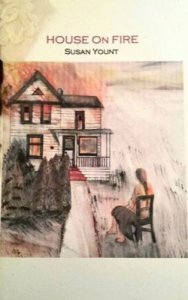 "House on Fire" reads as if Norman Rockwell and Steven King decided to write a poem together. It is the perfect visual of this family as everyday creatures dangling on the precipice of eruption. We see the "house is kindling-/with a wood burning stove." The mother "is a gray bluebird/toasty in a tarnished coop." The father is "a devil,/his pitchfork in the hay." The sister "is a chicken breast/baked dry on a cracked glass tray." All the while, the speaker "can hear the red stream calling, a shallow ditch swelling with pain." Every aspect of her environment is an omen of what has come, what will continue to come. Later poems, like "The Oracle," show the speaker in adult life, trying to deal with her past, remembering "the house/where you practiced/your death." We see that the past is still effecting her, haunting her: "You haven't asked to see/the future--//you remember it." Again, the fear of never being able to escape her past are prevalent in "Father's Hands": "one pink strip from throat to memory/dreams scrape me." Her past is a scar, deeper than any physical injury, and in "For a Complete List Turn to Page 422" we see a unique manifestation of this scar as this poem is a guttural list of all the faces/names the speaker has donned over time. Harsh and helpful acronyms flash by in brief summary of a lifetime of struggle to create a perfect portrait of a survivor. And that is what we, as readers, come away with-a poignant image of a bloodied but breathing woman, who is still here even after everything. In "Old Photograph," we are left with the speaker pondering a moment in her past "4 years before my first death." In her own words, she sums up this chapbook: "I am ruin, a drunken pantoum. You can never forget/my secrets, my suffering." And she is right, we can't, we won't.